We accept final art in PDF/X1a and PDF/X4 formats or as a native layout with placed graphics and complete font sets. To send a PDF file, please follow the guidelines on our File Preparation page while creating your layout. Next, use the link below to download a PDF settings file, then install on your system. These PDF presets are optimized for Queen Beach Printers’ prepress workflow. 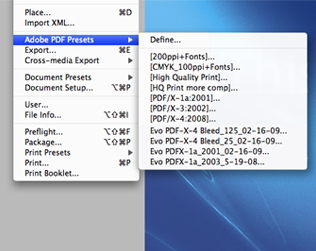 A “How To Install” PDF is included and will provide guidance for installing and using the settings file. We periodically change these files to reflect adjustments in our workflow. Be sure you are using the latest versions, QB_Printers_PDFX-1a_3-09 and QueenBeach_PDFx4_Bleed_125 for Adobe CS or Queen Beach Printers PDFX-1a-2001 and QB Printers_QX8_nt .125 Bleed_09-29-11 for QuarkXpress. If not, simply download and install now.